Another tea that I just couldn’t resist trying from David’s Teas was the Creme Brulee. 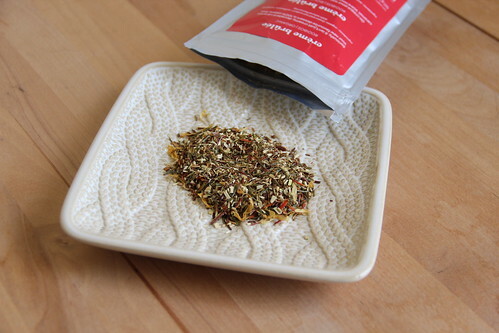 From the website it includes organic green and red rooibos tea as well as safflowers, marigold and caramel flavoring. Creme Brulee is available in a few different sizes: 50g for $7.75, 100g + free tin for $15.50, 250g + free tin for $38.75 and 500g + free tin for $77.50. 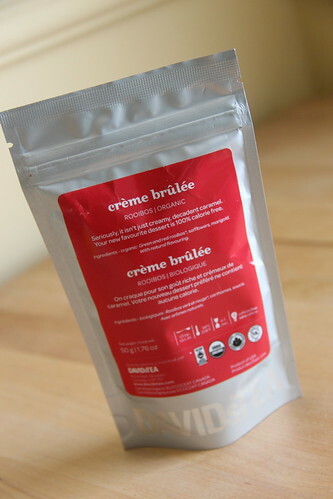 When I first opened the bag it smelled deliciously like caramel with a few almost spicy notes. Once brewed I could smell a mellow blend of the green and rooibos teas, and still a tinge of the sweet caramel. It tasted smooth and sweet, deliciously dessert like. I can totally picture this being the perfect rainy Sunday tea. And best of all it’s decaf!